MinXSS is a 3U CubeSat developed and operated by the University of Colorado at Boulder to gather scientific data to further the current understanding of the energy distribution of Solar Flare Soft X-Ray emissions and the associated impacts on the Earth’s Ionosphere, Thermosphere and Mesosphere. Despite decades of continuous solar Soft X-Ray Observations, no spectral observations are available reaching the quality needed to assess the solar x-ray energy distribution. This is because the vast majority of measurements used broadband instruments covering a wide spectral range but lacking the resolution needed to fully understand the varying contributions of emission lines with particular focus on thermal and non-thermal continua. MinXSS is expected to collect measurements that will enable scientists to understand how highly variable X-rays affect the near-Earth space environment, advance the knowledge of flare energy dynamics and deliver new spectral observations of the solar soft X-Ray emission near solar maximum. 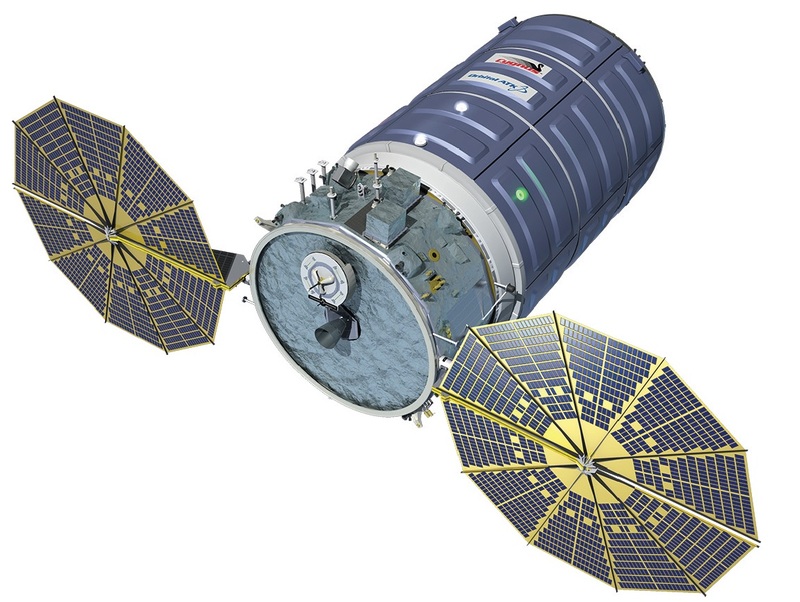 The MinXSS mission also has educational objectives, providing students with an opportunity to get hands-on experience in the development, construction and operation of a satellite mission as well as the modeling involved in the conduct of a science mission. 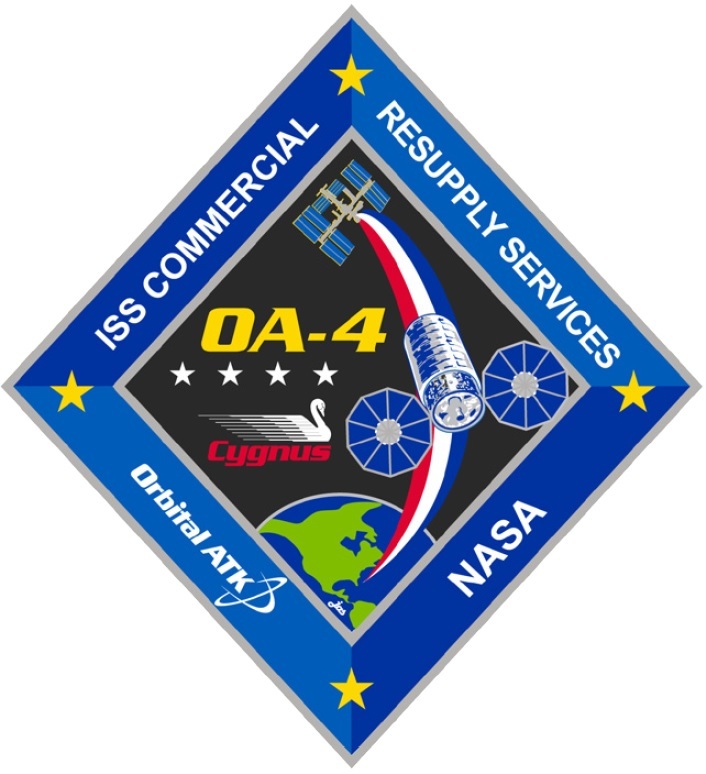 Two MinXSS satellites are planned to be launched, the first deployed from ISS into a rather short-lived orbit for a verification of the satellite platform and the performance of the X-Ray instrument and the second mission to a long-lived polar orbit optimized for a long-duration science mission. MinXSS sets out to complete full-disk solar Soft X-Ray irradiance measurements at a spectral resolution exceeding 1 nanometer and an accuracy better than 30%. 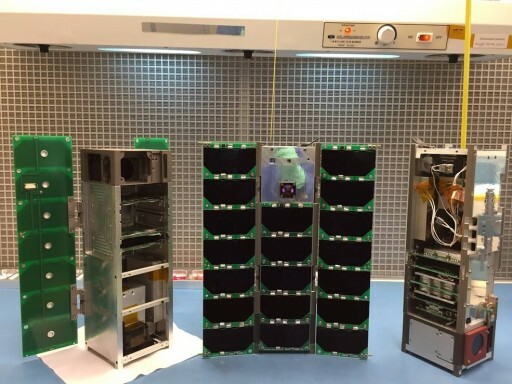 To accomplish this within the size and mass limitations of a CubeSat mission, MinXSS introduces Silicon Drift Detectors that permit instruments to cover a wider spectral range than their heavier predecessors while reaching a much higher spectral separation than conventional instruments. The measurement of Soft X-Rays coming from the sun is of critical importance for atmospheric science, but energy dynamics in a region of 80 to 150 Kilometers are very hard to observe directly. Energy from Soft X-Rays incoming from the sun are usually deposited in the ionospheric E-region between 80 and 150 Kilometers, however, the precise altitude depends on the Soft X-Ray spectrum because of the very steep slope of the photoionization cross sections of atmospheric gases in this wavelength range. Using spectral data that is well resolved will allow for a more predictable assessment of energy distribution in Earth’s atmosphere. 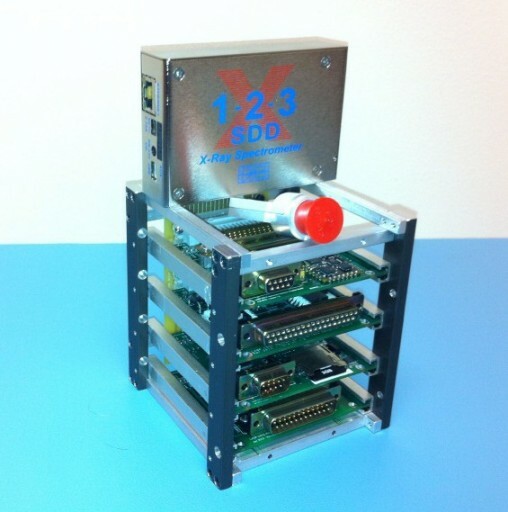 MinXSS is a three-Unit CubeSat measuring 30 by 10 by 10 centimeters in size and comprising three sections – one CubeSat Unit is occupied by the instrument payload, 1.5 U facilitate the platform electronics and the remaining 0.5U houses the Attitude Determination and Control System. 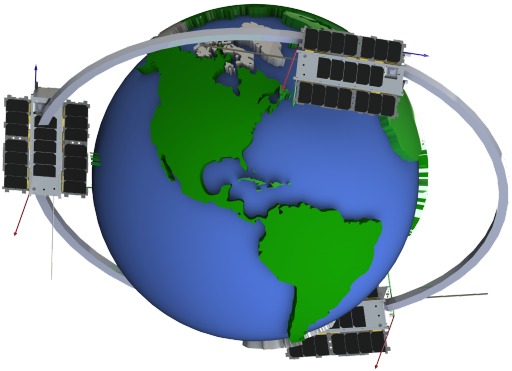 The Electrical Power System of the satellite is built around a deployable solar panel design because of the power requirements of this mission. Modeling showed that the satellite would need an average in-orbit power of 6 Watts, but body-mounted solar panel designs only deliver an average of 7 Watts, leaving an insufficient margin. Therefore, it was decided to employ a deployable solar panel system with a double deployed 3U panel array along with a fixed array in the center, facilitating a total of 28 triple-junction solar cells. When in a sun-pointed attitude, the spacecraft generates 20 Watts of power which will provide a sufficient orbit-averaged power to keep all satellite systems active at all times and handle peak power demands without issue. Electrical power from the solar panels is fed to two Lithium-Ion batteries with a storage capacity of 14.8 Watt-hours delivering a voltage of 6 to 8.5 V to the power system. A Battery Charge Regulator is used to control the state of charge of the battery assembly, and regulating the voltage delivered from the array to a maximum of 8.4 V.
A Pseudo-Peak Power Tracking system implementing a current-limiting resistor for the solar panels is used to avoid battery regulator oscillations and an overall increase in power availability for proper battery charging by maintaining an optimal position on the solar cell current-voltage curve. The resistor will generate up to 2.6 Watts of heat when in its current-limiting function at the lowest battery voltage. When the state of charge increases and battery voltage rises above 8V, the resistor will only generate 0.1W of thermal energy. 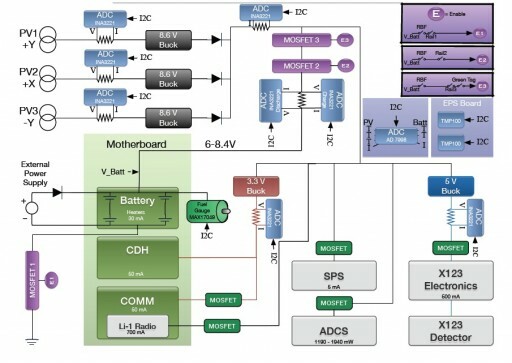 The drawback of this simple current-limiting design is that it is fixed and can not be adjusted in flight to match the maximum power point on the solar array I-V curve, as done by conventional Maximum Power Point Trackers. The Attitude Determination and Control System of the MinXSS satellite ensures the satellite maintains a three-axis orientation in which the solar panel and instrument are facing the sun, the Star Tracker points to deep space and the thermal radiator is facing the anti-solar vector. Attitude Determination is accomplished using Star Trackers, a coarse sun sensor and an Inertial Measurement Unit while attitude actuation uses reaction wheels and torque rods. The IMU is primarily used during the initial de-tumble of the satellite and to reduce body rates whenever angular motion is too large for the Star Tracker to acquire an attitude frame. The Star Tracker is an optical imaging system that collects photos of the star-filled sky that are then analyzed by a computerized algorithm that compares the star patterns against a large catalog in order to calculate the precise satellite attitude. In case of a safe mode or a failure of the Star Tracker, the coarse sun sensor can be used to face the solar panel towards the sun. A magnetometer is used to provide the inputs for the magnetic torquers. A Kalman filter is employed in the attitude determination system. The primary attitude actuator is an assembly of three reaction wheels that are unloaded at regular intervals by the three magnetic torque rods. Overall, MinXSS has a pointing accuracy of+/-0.003° on 2 axes and 0.007 on the third. 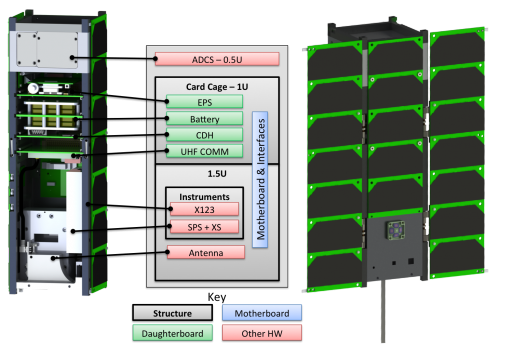 The modular XACT (fleXible ADCS Cubesat Technology) unit housing all ADCS components weighs around 700 grams and draws a peak power of 2 Watts. 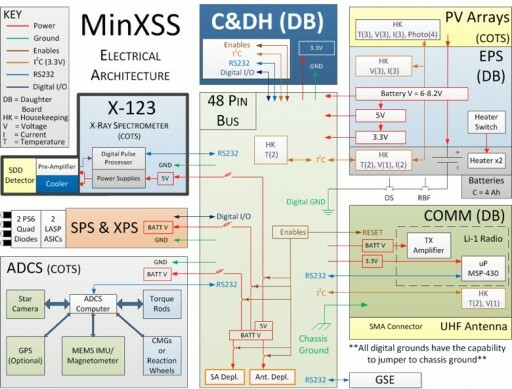 The Command and Data Handling subsystem of the MinXSS satellite is centered around a DSPic32, 40 MIPS, 16-bit processor module that completes all command execution, spacecraft monitoring and data handling tasks. Two monopole antennas are deployed when the satellite is in orbit, connected together with a 180° hybrid for RF communications. This dual monopole configuration is widely used and exhibits a gain pattern very close to that of a dipole antenna. The communications board is built around a Gaussian Minimum Shift Keying modulation processor that interfaces via a GMSK modem with the Command and Data Handling Subsystem. The transceiver operates at the 433 MHz amateur radio frequency reaching a transmission data rate of 9.6 kbit/s. The primary payload of the MinXSS satellite is a X123 X-Ray Spectrometer that is tasked with recording the solar flare Soft X-Ray emission from 0.4 to 6 nanometers with a high energy resolution to resolve the energy distribution in order to be able to predict the energy distribution into Earth’s atmosphere for particular solar flares. The MinXSS instrument hosts a Silicon Drift Detector with an active area of 25mm², an effective silicon thickness of 0.5 mm and an 8-micrometer thick beryllium filter. The detector is housed in a vacuum chamber and a two-stage Thermoelectric Cooler is used to keep the detector at its operational temperature, limiting dark currents. Multichannel Analyzer electronics are used for the detector read out. X123 has a field of view of +/-4 degrees which requires a pointing accuracy of 2° in order to keep the target within the field of view. The detector covers an energy range of under 1keV to over 5keV with a resolution exceeding 0.5keV – a critical measurement in a gap of current knowledge. Despite several decades of observations at the relevant SXR (Solar Soft X-Ray wavelengths), the available measurements include a significant gap of well resolved spectra at the critical 0.4-6nm band. A number of missions flown in the 1980s and 90s have shown a number of previously unknown aspects of solar flares such as temperature, electron density, and elemental composition of flares. Current missions continue gathering a record of solar flare spectra in the hard X-Ray and Extreme Ultraviolet wavelengths, but the solar flare spectral variability peaks at the 2nm wavelength, currently in the gap of possible measurements. MinXSS will deliver measurements of solar SXR irradiance for a more complete understanding of flare variability in conjunction with measurements at the HXT and EUV wavelength range. Knowing where in the atmosphere energy from solar flares is deposited is critically important for assessments of Earth’s energy balance and atmospheric dynamics. SXR radiation energy is distributed between 80 and 150 Kilometers in altitude, strongly depending on the SXR spectrum and its energy peaks. This is due to a steep slope and structure of the photoionization cross section of atmospheric gases in this wavelength range, particularly the steep K-edges of Oxygen at 2.3 nm and that of Nitrogen at 3.1 nm. A measurement of integrated irradiance values across a broad band between 0.5 and 5nm can not provide any information on where energy will be deposited, requiring a much higher resolution to determine in which atmospheric region the energy is introduced. These critical measurements will be provided by MinXSS.